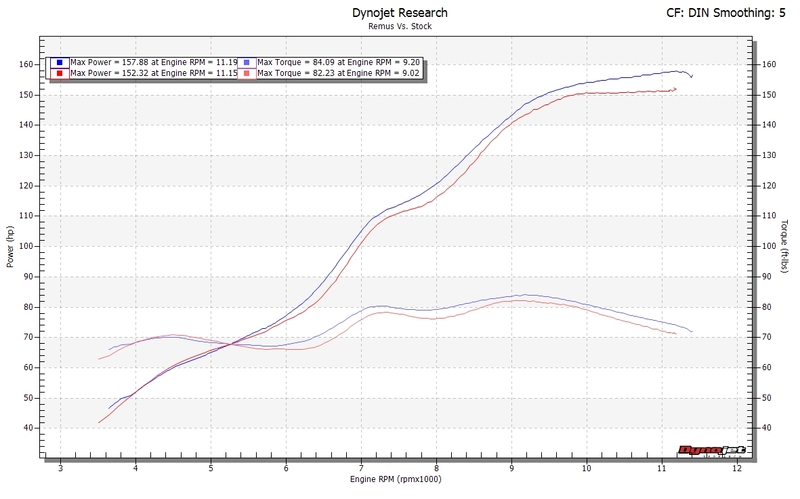 Suzuki GSX-S1000 F Dynojet Power Commander fit – results. So I’ve spent the last few weeks riding round on the GSX-S1000 after it had the Dynojet Power Commander fitted. And what a difference… Dynojet UK boss Frank Wrathall got the bike collected, took it up to Cumbria and fitted the PC, before mapping it with the Remus pipe in place. 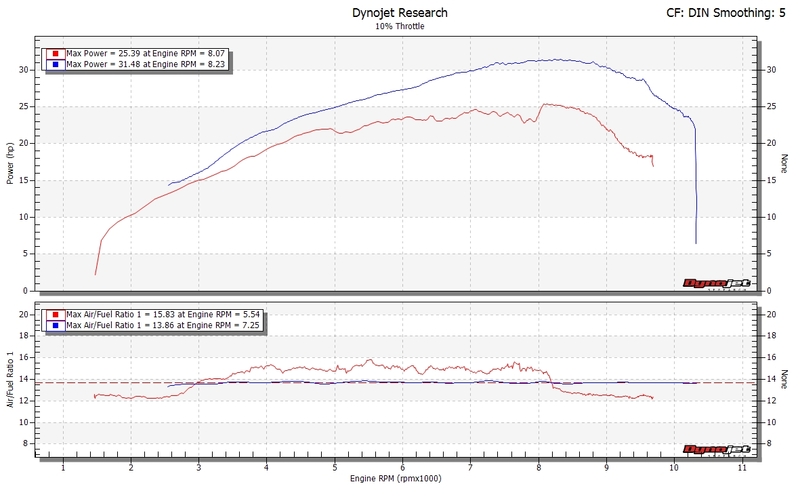 As I said in the previous post, Dynojet has discovered that the stock bike is quite messy fuelling-wise, particularly at lower throttle openings. Charging about everywhere at 100 per cent throttle masks the situation a fair bit, but when you look at the 10, 20 and 40 per cent throttle opening graphs, it’s clear that the Euro 4 Emissions rules have had a real stymying effect on the GSX-S.
I’ll confess I hadn’t thought there was too much wrong with the stock bike. Most of my rides had been fun blasts on fast A roads, or fast cruises on motorways though, where you won’t see the flaws so much. And after a few rides, you adapt and ride round the odd hesitation. 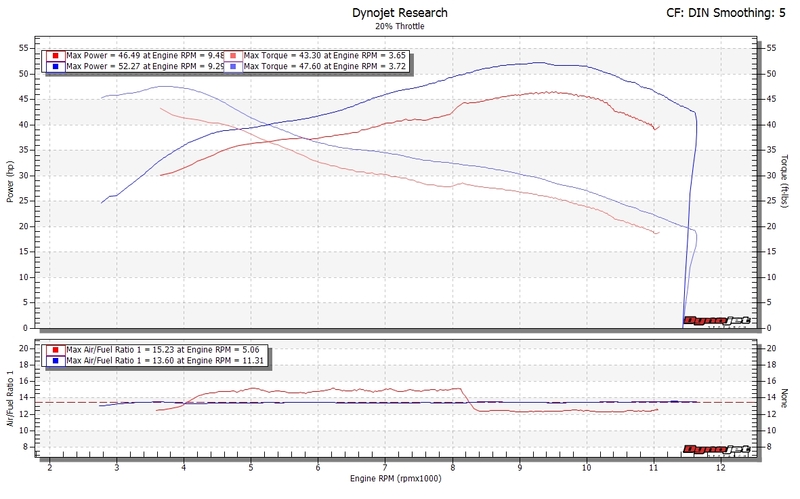 I’d accepted the stock setup as pretty decent for a detuned naked litre motor. Remus end can vs stock seup, with PC mapping. But the difference with the PC in place is immense. The delivery is now smoother, yet also more aggressive. The midrange bulges with creamy grunt, then feeds into the same beefy top end scream as before. And there’s a lovely burble that’s appeared low down too, which I’m certain wasn’t there before, as if there’s stronger combustion taking place. 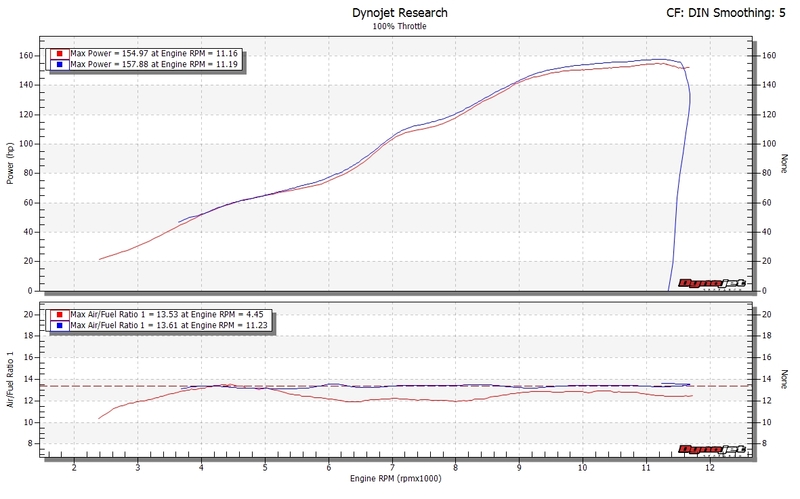 GSX-S1000 at 10 per cent throttle, Remus end can fitted, before and after PC mapping. Frank sent me a selection of graphs showing the before and after. They’re pretty impressive – but this time, it’s the seat of the pants feel that’s really remarkable. Check out the 10 and 20 per cent graphs, in particular, check the air/fuel ratio around 8,200rpm. On the stock bike, the mixture slams from lean to rich, giving a big step in the torque. That’s the O2 sensor in the exhaust making the ECU run on a closed-loop fuelling, where it constantly ‘sniffs’ the exhaust, turning down the fuel all the way to 8,000 revs, then it goes the other way in an attempt to catch up. This is all down to emissions regs, EU4 limits mean manufacturers have to run bikes lean to reduce the amount of CO, HC and NOx coming out. 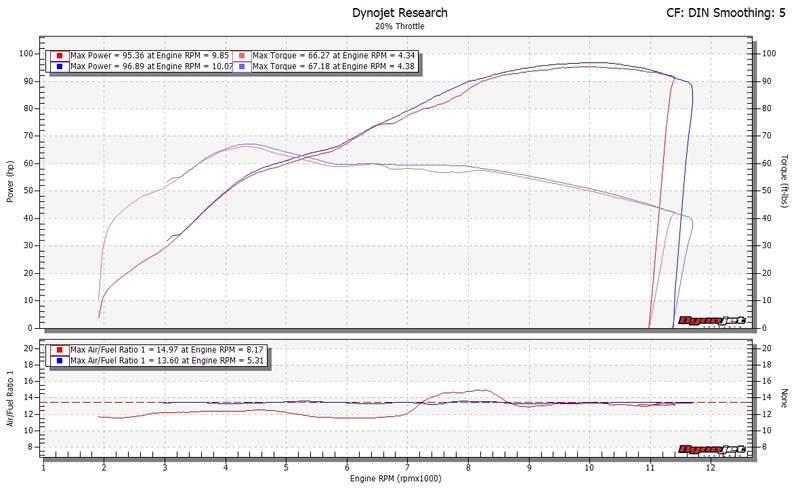 The Dynojet kit replaces the O2 sensor with a fixed resistor though, so the ECU thinks the mixture is what it’s looking for all the way through, so it stops fiddling with the mixture. Then the Power Commander intercepts the injector signal, adding or removing fuel to give the proper stoichometric fuel/air mix through all the revs, at all throttle openings. Phew! Stock GSX-S1000 with Remus end can, 40 per cent throttle (ignore the top caption), before and after PC mapping. •Cheers to Frank and Dean for their help! www.dynojet.co.uk is where Santa needs to go to pick up a Power Commander V for you!